The 1918–1919 influenza pandemic infected 500 million people worldwide—one-fifth of the world’s population—and claimed between 20 and 100 million lives; 675,000 deaths occurred in the United States, over ten times the number that died from battle-related injuries during the recently concluded World War I. The same viral strain (H1N1) that caused this Spanish flu reappeared seven decades later as swine flu, infecting almost 20 percent of the world’s population, and causing 200,000–300,000 deaths from 2009–2010. The H1N1 viral strain is not your typical seasonal flu. Viruses have a strong attachment to living organisms, including humans, because they can only reproduce in a host cell. The virus attaches its proteins to the surface of a host cell, injects genetic material (DNA or RNA) into the host, and then pirates the host’s cell machinery to make more viruses, before moving on to another host cell. To prevent reinfection by the same viral strain, the host mounts an immune response, producing antibodies that prevent that virus from binding to the host’s surface. To survive, viruses mutate, changing their surface proteins, thus evading the host’s immune defenses. Antibodies produced in response to a previous flu infection are powerless to protect against a newly mutated strain. Hence, new and different flu vaccines are required each season. Viruses that replicate using DNA, such as smallpox, carefully check for any errors prior to reproducing its genetic code; therefore, they mutate slowly. By contrast, RNA viruses, such as influenza, bypass the time-consuming proofreading step when copying their genetic code; they mutate very rapidly, far faster than the host’s immune response can keep pace with the emergence of new viral strains. The flu virus can combine pieces of flu from avian, swine, and human sources. Pigs living snout to snout in pens readily pick up the virus from birds and humans and share it with their sty mates. Pigs harbor the mutated virus but are not, themselves, infected, although humans are. Such a mutated strain—the H1N1 Spanish flu and swine flu—was radically different from earlier strains; humans had acquired no immunity and were defenseless against it. SEE ALSO: Adaptive Immunity (1897), Viruses (1898), DNA as Carrier of Genetic Information (1944). 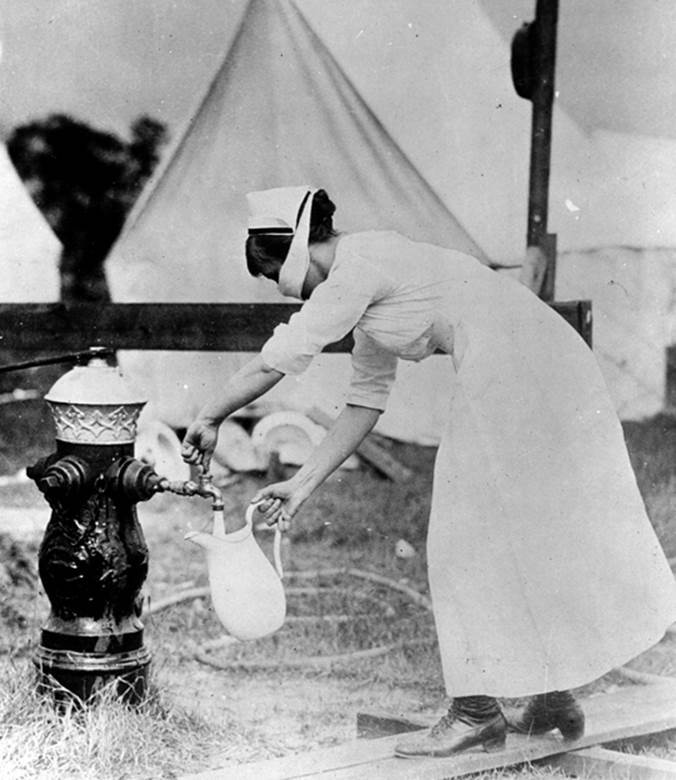 This 1918 photograph depicts a nurse filling a pitcher from a fire hydrant and wearing a mask as protection against influenza during the Spanish flu pandemic of 1918–1919.